Viralimalai is on the bus route between Madurai and Tiruchy. It is 25 kilometers from Tiruchy and 40 kilometers northwest of Pudukottai. From Azhankudi Viralimalai is 371/2 Kilometers. A railway station is very close to the town. Viralimalai temple is on top of a big rock and can be seen from a great distance. 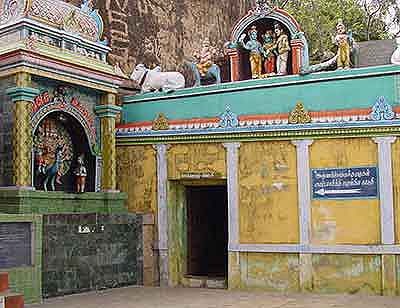 Viralimalai temple is situated in the heart of the town of Viralimalai. Hence the town takes the name of the hill. Buses, which ply from Tiruchy to Madurai and from Pudukottai to Illupur go via Viralimalai. Devotees can reach Tiruchy by road, rail or air and hence proceed to Viralimalai. In Tiruchy and Viralimalai there are many private boarding and lodging houses and food facilities are also available. 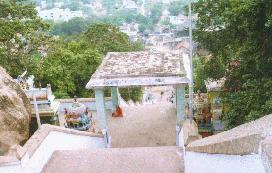 The flight of steps leading to the hilltop temple. 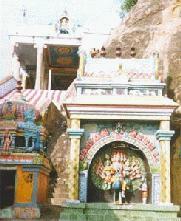 Arunagirinathar is directed to Viralimalai by Lord Murugan disguised as a Veddar. 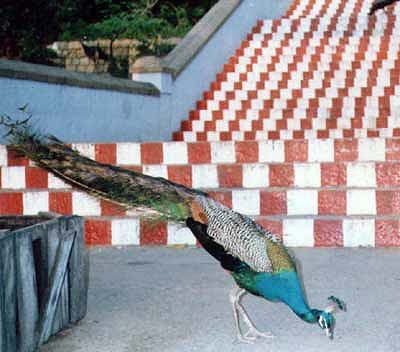 Viralimalai Hill is home to hundreds of peacocks. The hill is small and rocky. From the foot of the hill a beautiful flight of steps take us to the top. These footsteps are engraved on the rock and are 207 in number. In between there are beautiful mandapams for devotees to rest. There are thick woody orchards on the hill and peacocks abound in these orchards. 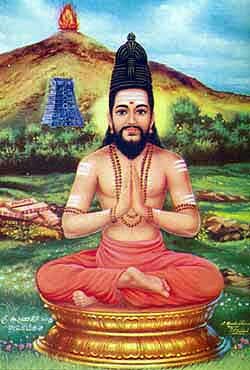 Great saints and yogis are said to have lived in the form of Kura trees and worshipped Lord Muruga and hence the name Viralimalai derived from the Tamil word Viravi.  This temple is specially known for the peacocks that are found in plenty. Cigar is a unique offering similar to the sandal paste offered to Lord Dandayudhapani during Arthajama puja in Palani. During the reign of Ramachandra Thondaiman of Pudukottai the Lord is believed to have appeared in his dream and requested the offering of cigars for the Kalasandhi and Sayaratchai puja. The king is said to have been cured of his diseases after the offer of cigars to the Lord according to history. 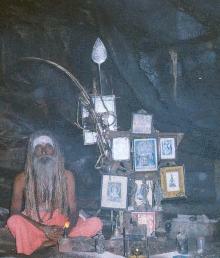 We also find a number of caves in which saints and yogis have performed penance. This is a place where the Lord blesses devotees with the power to control the indriyas or senses. Rishis Narada and Kashyapa offered prayer to Lord Subrahmanya for getting their sins propitiated. The mute Sivachariyar obtained the power of speech after worshipping Lord Murugan here. These and many more are the marvels of this temple. We find the statue of Kashyapa Muni and Narada Muni in the hill temple along with sculptures of Arundhati and Vashishta. We also find the sculpture of Arumugan and Arunagirinathar on the pillars found on the way to the temple. The temple is located on top of the hill and can be seen from a great distance. 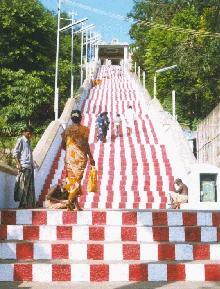 A beautiful flight of steps along with mandapams for devotees to rest, take us to the top of the hill. At the foot of the hills the water tank called Saravana Poigai is located on southern side. On the eastern side there is a Srine for the goddess Maikannudaiyal. It is customary to worship this goddess before climbing up the hill. On the way to the hill top we find the Idumban Sannidhi a small cave Srine for Meenakshi Sundareshwar and a mandapam called Sandana Kottam at the end of the flight of steps. Adjacent to the Sandana Kottam Mandapam we find the Navaratri and Shanmuga Moorty Mandapam. Next to the Navaratri Mandapam we find the south-facing Raja Gopuram. In the Shanmuga Moorthy Mandapam of this temple with a single prahara the utsavamoorthy gives darshan together with devas. In the western part of the prahara we find the Srines of Vinayagar, Dakshina Moorthy, Agasthiyar and Arunagirinathar and in the northern side we find the Srine of Chandikeshwarar and Bhairavar. The Navagraha shrine is located on the way to the Maha Mandapam in front of the sanctum sanctorum. In the Maha Mandapam Natarajar, Sivakami, Manika Vinayagar and Srinivasa Perumal with consort await to bless the devotees. On the outer walls of the garbhagraha we find inscriptions. Inside the sanctum sanctorum Lord Muruga showers blessings upon the devotees. 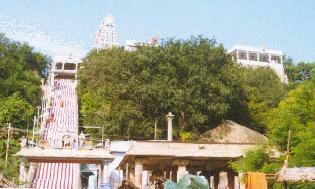 On the southern part of the foothill Saravana Poigai, the Sthala Theertham is located. It is also called Naga Theertham. The Sthala Vriksham in this temple is Kasi Vilvam. The vision of the Lord inside the Garbhagraha is soul-stirring. The Lord is in the form of Arumugan, six-faced and with twelve hands seated elegantly on the peacock facing east. The divine consorts Valli and Deivannai stand on either side. As the Sivachariyar offers camphor the devotees can see the three faces at the back in the mirror which the other three can be viewed directly. Sages and saints were in the form of Kura trees and worshipped the Lord of Viralimalai. Hence this place was called Viravi Malai which later became Viralimalai. 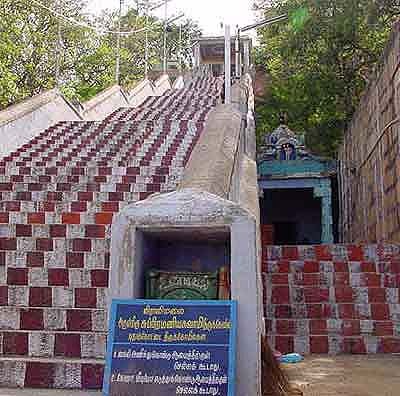 The poet Saint Arunagirinathar has mentioned in his songs about saints staying and worshipping Lord Muruga in this hill temple. Saint Vashishtar's wife Arundhati forgets to feed Lord Murugan when he was born at Saravana Poigai. Due to this her husband cursed her. In turn Vashishtar was cursed by Lord Murugan for the ill fate he brought on his wife. As per mythology both Vashishtar and his wife Arundhati prayed here in Viralimalai to ward off their curse. Saints like Kashyapa Munivar and Naradar are believed to have offered their prayer here in Viralimalai to ward off curses. The representative of the Palayamkarar Karupamuthu Pillai used to visit the temple every Friday. During one such visit, due to heavy rains there was flood and tanks bunds were broken. The river Mamundi was also flooded and Karupamuthu Pillai was cut off from the mainland. He neither had food to eat nor cigars to smoke and was in great misery as he was a chain smoker. 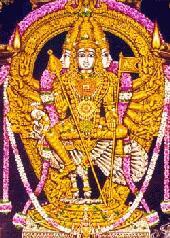 Lord Murugan appeared before him, gave him cigar and matchstick and also took him to the temple for darshan. From that day cigar is offered to Lord Murugan along with neiveidyam and given away as prasadam to devotees. When the temple and its allied properties were acquired by Vadi Lakkaiya Naicker, the temple was renovated and built by their successors and the descendants of Marungapuriyar. In the 18th century the temple was under the control of Pudukottai Thondaiman. In the 18th and 19th century during the Karnataka war Viralimalai Tiruchirapalli was a military area. The tourist Bungalow here was built in 1822 for the army chiefs to halt and rest. The Palayamkarar's used to offer cigar to the Lord. The daily puja is performed six times a day and as per Kamika Agamam. Taippucam, Pankuni Uttiram, Kanda Sasthi and Adikrittikai are the main festivals as in other Murugan temples. On the outside wall of the sanctum sanctorum, we find a few inscriptions. These contain certain information on the history of the temple. Muthu Pazhani Kavirayar authored Viralimalai Kuravanchi. This Kuravanchi was staged regularly every year during festivals. Legend tells us that Saint Arunagirinathar was directed in a dream to go to Viralimalai, which in those days was situated amidst thick jungle. Not far from Viralimalai Arunagiri lost his way in the jungle. 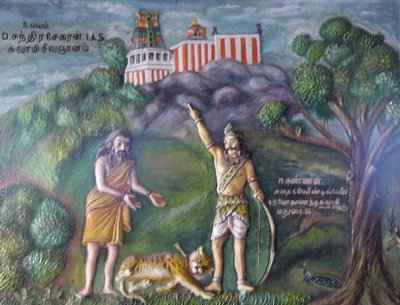 From out of nowhere there appeared a Veddar or hunting tribesman who guided Arunagiri to large rock from where he could see Viralimalai hill. The Veddar vanished and only then did Arunagiri realize that his mysterious guide was none other than Lord Murugan Himself. Today the spot is marked by an ashram where bhaktars meditate on Lord Murugan's mercy. Poet saint Arunagirinathar described the beauty of the Lord, the way Śrī Krishna hide the sun with floods, the way peace was brought into the Uruthirasanmar Sangha before he wrote divine verses on Lord Murugan. From his verses and lines we understand that Arunagirinathar was in his youth while he wrote these poems and also that Viralimalai was a part of Konadu. When Arunagirinathar was in Viralimalai the Lord gave him jnanopadesam in the Sandana Kotta Mandapam and we can decipher this information from his verses. 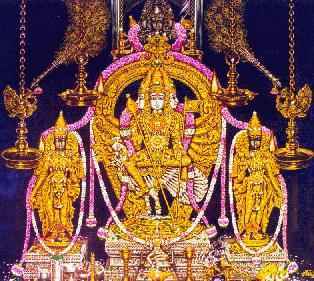 Viralimalai has been praised by Arunagirinathar is 16 verses of Tirupugazh (344 -364). In Shastra Kovai Pillai Tamizh the 25th song is about Viralimalai. article by Viralimalai Temple Trustee D. Chandrasekaran, I.A.S.